Helene feels like a big, fat sausage. It’s probably because that’s what the girls she goes to school with have been telling her for what feels like forever. The only time she feels like she can escape her embarrassing life and repulsive body is when she is reading Jane Eyre. Jane Eyre was misunderstood, too. So, when Helene is reading about Jane’s life, she feels like there might just be a place where she fits in, because if Jane was able to find it, maybe she can too. When Helene is forced to go on a camping trip for school, she initially dreads it. And, at first, it is just as miserable as she thought it would be. But when she first catches sight of a fox and then has a chance to make a new friend, the camping trip and life in general start to seem more bearable and perhaps even fun. Helene realizes that, just by making one connection, her whole world could open up in ways she never thought possible. 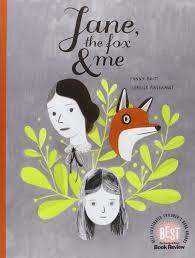 Jane, the Fox, and Me is a poignant graphic novel. It uses text sparingly, instead using graphic effects to indicate transitions and tell the story. The artist uses color particularly well. Helene’s own life is, at first, depicted only in grays, and the actual colors in the book come when she is imagining the life of Jane Eyre. However, as she gains confidence, color crops up in her own reality as well, which immediately changes the tone of the story from somber to hopeful. Helene’s story does begin as a very depressing one due to her misery and isolation. Her problems are ones that many young girls, especially, could relate to. She is hurt when the other girls at school tease her and struggles to connect with others. She has negative body image and also worries about her family making ends meet. All of these are relatable issues. Though they are not entirely resolved by the end of the book, Helene’s many worries do seem more bearable once she has a friend to connect with.